Google’s AI AlphaGo has defeated Ke Jie, the world’s top Go player in the first game of his match. While Ke Jie aimed to beat Google’s AlphaGo with its own play of unusual style, but didn’t work out in his favor. 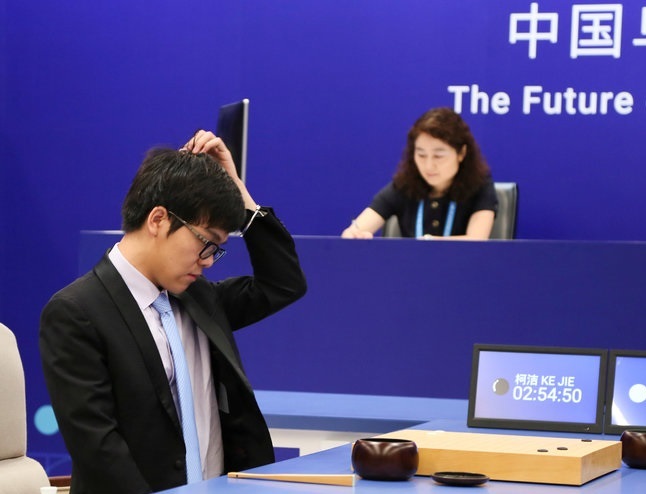 After the match continued for four hours and fifteen minutes of play, Chinese grandmaster Ke Jie resigned which ultimately lead the AI platform to score a 1-0 victory in the best-of-three match. Let’s dive in to see some more details on the matter. AlphaGo is a Go-playing platform built by Google’s researchers at the DeepMind lab. AlphaGo became the first machine to beat a professional Go player last year when it went face-to-face with the Korean grandmaster, Lee Sedol. Commentator, Michael Redmond and 9th-dan professional said before the match that everyone recognizes that Ke Jie is the strongest human player. Even though Ke was defeated, his strategy suggested that 19-year-old Chinese prodigy has learned from the unorthodox approach of AlphaGo. Google’s AI AlphaGo won by a close margin, only a half point. However, this is the characteristic of the machine’s style of play as it chooses moves that leads it to a victory. Henceforth, it does not take into account the numbers by which it won. Nonetheless, even though the final results were not that different, AlphaGo seemed to have a head start from the beginning of the game. According to the CEO and founder of DeepMind, Demis Hassabis, AlphaGo sports a more powerful and stronger architecture. Now, it can learn the game by playing against itself. This allows the machine to rely less on the data generated by humans. With that said, DeepMind’s technology can now learn any task with ease. AlphaGo and Ke Jie are facing off at Google’s Future of Go Summit in Wuzhen, China this week. The next game will take place on Thursday in China and Wednesday evening in the United States. The finale will be held on Saturday. On Friday, AlphaGo will be further tested in the two stipulation matches. In one match it will act as a teammate to two Chinese professional players playing against one another. The other match is where things will heat up as AlphaGo will take on five Chines pros together. There will be more to the story, so be sure to stay tuned for more details. As for now, what are your thoughts on Google’s AI AlphaGo? Share your views with us in the comments.